Smart Defragmenter infection can be classified as a Rogue Anti-Spyware. As soon as the unwanted application infiltrates into your computer’s system, the software will be configured to open automatically. Smart Defragmenter will pretend to scan your computer’s system; however the results are completely worthless. In addition, you will not be able to run certain programs. You should not let some suspicious software to sabotage you. If you want to regain control over your computer, you will have to take care of Smart Defragmenter removal immediately. How does Smart Defragmenter act? Every time you will try to erase or open applications, the rogue will start to show a variety of pop-up windows. These messages will claim that your computer’s system is full of errors. As long as Smart Defragmenter is in your computer, you will not be allowed to run executables. For instance, you may see this message: “System Error! / Exe file is corrupted and can’t be run. Hard drive scan required. Scan Hard Drive”. However, if you try to run the application many times, your PC will be able to eventually launch the software. Keeping the program might mean that you may not be able to use your computer properly. Therefore, you should delete Smart Defragmenter as soon as possible. Smart Defragmenter states that your computer needs professional help. 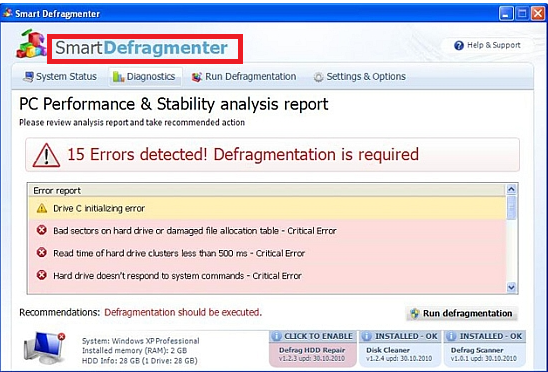 In order to fix your PC, Smart Defragmenter will suggest you to buy the program. However, we do not advise you to pay the money because you will not be able to get them back. In addition, Smart Defragmenter is only a fraud that has solely one goal and that is to gain revenue. If you launch this “Defragmenter”, it will notify you that your computer has to be run in Safe Mode. The application will display a fictitious Safe Mode screen. No reliable program acts in such a way; thus, Smart Defragmenter removal is necessary in order to regain your PC’s security. Smart Defragmenter will try its best in order to make you believe that your computer is actually at great risk. This Rogue Anti-Spyware will annoy you with all kinds of alerts. These alerts are fake and only used to make you purchase their “product”. You should not do that unless you want to support cyber criminals. If you have already payed the money, you need to instantly call your credit card company and explain the situation. Also, do not forget to remove Smart Defragmenter once and for all from your electronic device. As you can see, Smart Defragmenter uses multiple methods so that you would believe that your computer has been really infected with serious malicious software. However, the only issue that your virtual machine really has is Smart Defragmenter. You should uninstall Smart Defragmenter before the rogue has caused even more irritating problems. How to remove Smart Defragmenter from my computer’s system? Smart Defragmenter is a severe computer infection; hence its elimination has to be executed properly. The best method to delete Smart Defragmenter from your computer is to download a reliable anti-spyware program Wipersoft The software will ensure your computer’s security in the future.